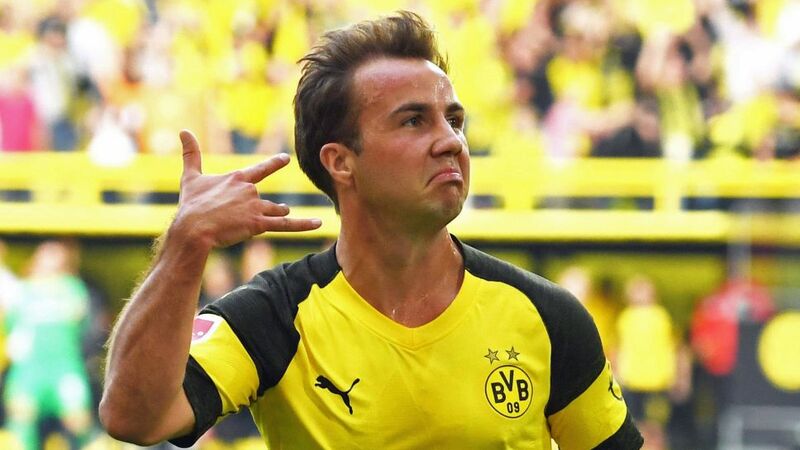 Borussia Dortmund’s surge to the top of both the Bundesliga and their UEFA Champions League group has been very much a team effort and now FIFA World Cup winner Mario Götze - reprising his role as a false nine - looks like he could have a key part to play. Götze has had his ups and downs since scoring the goal that won Germany the 2014 FIFA World Cup, with muscle tears, an ankle issue and a metabolic disorder all leading to lengthy absences. The 26-year-old managed over 30 appearances in all competitions last season following two tough years, but this term there are signs that he could become even more influential. A goal from the bench in the spectacular 4-3 win over Augsburg on 6 October certainly helped, and Götze seems even more liberated by Lucien Favre’s decision to restore him to a role he knows well from international duty. With starting places in central midfield locked down by the impressive pairing of Axel Witsel and Thomas Delaney, Götze was deployed as a so-called false nine for the 4-0 win over Atletico Madrid. A few days later – with striker Paco Alcacer still out injured - he got his second start in the same position, creating a goal in the 2-2 draw with Hertha Berlin. “It all comes down to how you play this role,” Götze said, when asked if he could grow to love the position. “If it’s expected of me to stand up top and score goals with my head, then it’s going to be tough. But the way we’re playing, I can certainly take a liking to it. Pep Guardiola had taken over at Bayern in 2013, and further popularised the false nine position in German football. By the summer of 2014, however, the Spaniard had brought out-an-out striker Robert Lewandowski to the club – so there had been no need for Götze to continue in the role. Götze suffered his first serious post-World Cup injury in October 2015 and was restricted to just 14 appearances in that campaign. A return to Dortmund followed but - due to illness and injury - the club’s prodigal son managed only 11 league outings in 2016/17. While last season was more promising, the Germany international was used mostly in the central midfield role that he reputedly prefers. This year looks different. With the freescoring Alcacer missing against Atletico, Dortmund fans may have been wondering who could start at centre forward. Favre had a plan to surprise one of the most miserly defences in Europe though, by returning Götze to the false nine role. The gamble paid off handsomely. Dortmund’s lone frontman in theory – actually wearing the number 10 on his back – kept the visiting defence occupied and often confused. What’s more, Götze’s clever pressing game saw him win the ball back in several different areas. When Götze’s progress at club level faltered, however, he may have gone back to basics in targeting a midfield berth. Favre’s instincts led to him being trusted again in a more advanced position - and given his game intelligence - perhaps that’s where the Memmingen native’s future lies. Whether he prefers a deeper role or not, Götze has shown that he is willing to be flexible for the greater good and that he still has plenty to offer Dortmund as a false nine. As if Favre needed it, the Swiss tactician now has another major attacking option at his disposal.